BEE GEE Realty Inc. presents The Illusionists! This mind blowing spectacular showcases the jaw dropping talents of five of the most incredible Illusionists on earth. THE ILLUSIONISTS – LIVE FROM BROADWAY has shattered box office records across the globe and dazzles audiences of all ages with a powerful mix of the most outrageous and astonishing acts ever to be seen on stage. This non-stop show is packed with thrilling and sophisticated magic of unprecedented proportions. 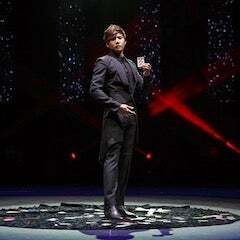 The Illusionists are some of the greatest magicians alive working together to provide a truly one-of-a-kind magic and entertainment experience that’s been amazing audiences since its debut. Each illusionist plays a unique role in the show and brings their unique brand of magic to the explosive production. The result is an unprecedented display of magic complemented by an impressive onstage band and crew of dancers. The Illusionists is defined by heavy audience participation and close-up tricks that will leave you scratching your head and wondering just how they managed to pull it off. Don’t miss the chance to experience this truly magical band of tricksters as they entertain and delight the audience with humor, dazzling production design and rocking music.